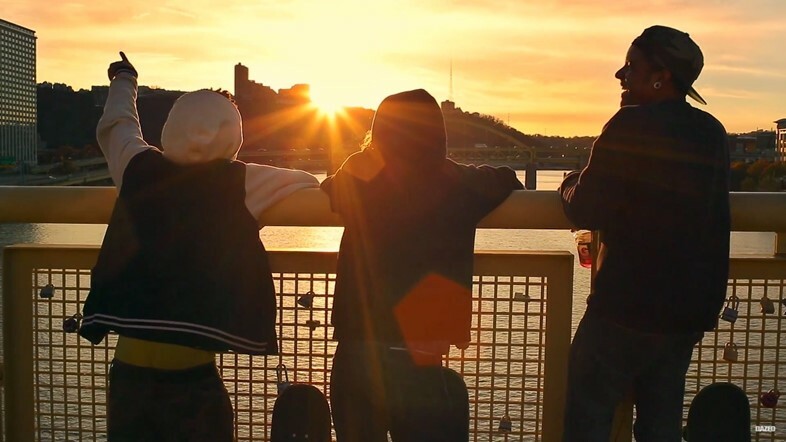 The Gates is a new short film based on the friendship between Jake Ecker and Que Dafoe, two Pittsburgh skaters who have just finished high school and are trying to figure out what to do next. Their hometown is located in the “Rust Belt”, a region in the North-East of the US that has been hit hard by post-industralisation and experienced a multitude of problems as a result – economic decline, population loss and urban decay. It’s here that this story is set and here that the boys pin their hopes and dreams. Ecker grew up riding dirt bikes on a small farm outside the city and dreams of running his own recording studio one day, while Dafoe is an aspiring rapper, who as a kid supported his single-parent mother of three. The narrative follows the boys as they revel in the last moments of adolescence and acknowledge their anxieties about an uncertain future. Here The Gates’ director Michael Casker (also a Pittsburgh native) tells us more about his work, how he met his protagonists and what compelled him to enter their world. What first inspired you to pick up a camera? Michael Casker: I always had ideas and concepts for things that I wanted to make, but they never materialised beyond terrible sketches or paragraphs of thought. I needed the right medium and that ultimately led me into photography. In the early days, I documented my relationships – I used to be quite nostalgic and felt afraid that I would one day forget experiences – so I photographed the people around me, because nobody else was. Michael Casker: I rarely do anything that isn’t influenced by someone close to me or an experience I had whilst growing up. In every scene or image you’ll find a reference to some part of my youth and because of that I can get a bit obsessive in my process. It’s important for me that the audience feel what I have experienced; I try to capture the moments that happen just before or right after when the photograph should have been taken. I want to convey the personality of my subjects, through those off-moments when they are not “ready” and expecting to be photographed. What attracted you to shoot in Pittsburgh? Michael Casker: Well, being from Pittsburgh, I often go back to see my family and I love to shoot there. The evaporation of the steel industry during the 70s put the city in a long lasting economic tailspin, and as the jobs left the city, so did many of its people. While Pittsburgh is now in the midst of a renaissance, the decay still remains and the ‘rebuild’ process has been slow. Though, it has created a cool dichotomy between the old and new; modern condos stand beside the city’s haunted gothic architecture and gritty public places. These are the kind of places kids – like those in The Gates – hang out, hidden away from the rest of the city and their parents. How did you meet the protagonists in your film? Michael Casker: I met Jake and Que at the Troika skate demo, which was part of a community day in a smaller neighbourhood in the city. I remember seeing their group of friends skate down the street and all you could hear was this ominous roar coming from their wheels on the pavement. They had this wild energy and I had a camera so I just went over and started filming them. I’m not even sure I asked actually, it just felt like it was supposed to be happening. What compelled you to enter their world? Michael Casker: I wanted to see what it’s like to be a kid at this time in history. Time and place can really limit a person, so I like to create worlds that I wished I lived in and experience a life that I was never a part of. They also just reminded me of myself at that age. The film explores ‘coming of age’ and the repercussions of that transition, what did you discover? Michael Casker: It was interesting to see the changes the guys went through during filming and the mental challenges that they faced. As filming progressed, they became more comfortable with sharing their anxieties with me. A trait the three of us have in common is the tendency to over analyse things. Jake and Que both care so much about doing something interesting with their lives and not falling into a dead end job. So, they put a lot of pressure on themselves to try to figure out a system that will work. I think a lot of kids have a moment when they realise that it’s not easy to make money and support yourself comfortably, it can be a brutal moment of revelation. It’s upsetting, this mental anguish and uncertainty results in an anxiety that ultimately dulls your enjoyment of life. It makes it difficult to live in the moment and be present; I’m always looking back and assessing how I handled a situation or I’m looking forward to see what’s next and how I can do something better. I don’t think it’s terrible to be analytical, it’s important for personal growth, however, there needs to be a balance, so that at some point you just enjoy your life. This is why I like making films, it gives me a chance to immortalise a set of emotions that I might not have been totally aware of at the time.